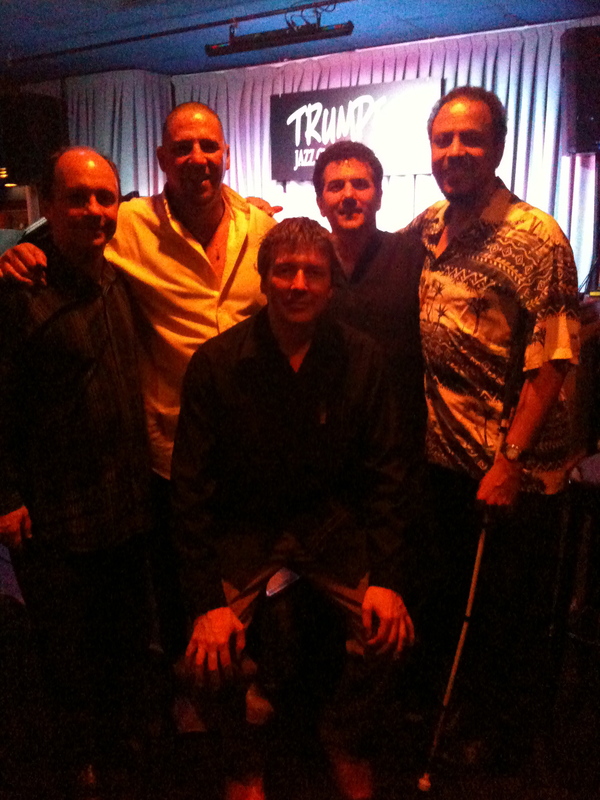 Great night Friday night at Trumpets Jazz Club with the Paul Meyers Band featuring Vanderlei Pereira, Helio Alves, and Leo Traversa. Normally Donny McCaslin plays with this band. I subbed for him. I really enjoyed Paul’s music. He is a fine writer. His tunes have emotion, spirit, and a clever use of harmony to convey his own distinctive sound. Helio Alves is a brilliant improvisor, and Leo Traversa has a gorgeous sound on this really beautiful 5 string electric bass he played. Vanderlei Pereira having been born in Rio has really a different way of playing jazz. Paul has a lot of Brazilian flavored music and of course this is right up Vanderle’s alley. He has a key instinct for the music as he makes all hits and and section changes by instinct. It is amazing. Does not sound too difficult make all the hits and deal with the form of the music. For most it is not. You just follow the chart and give to the music, but Vanderlei’s chart is his ears as he is blind. I was so blown away by him. Not because he is blind, but from his playing. A great player. All great players!! And great music. In addition Trumpets has improved their musical venue by extending the stage a bit to make more room for the music. The sound and light additions have really helped. It is a much better venue to play because of these improvements.